The real dragons of today’s world stomp around like dinosaurs in the remote equatorial hills of their namesake island in Indonesia, Komodo. While these giant lizards may not fly, or breathe fire (although their bacteria-laden saliva is deadly), they are capable of a feat equally miraculous: virgin births. In 2006, Flora and Sungai, two female Komodo dragons housed at the Chester and London Zoos, respectively, were the first discovered cases of virgin birth in the world’s largest lizard. They are examples of a process called parthenogenesis, the scientific term for single-parent reproduction. This process is almost never seen in animals as complex as the Komodo, and has only been documented in 0.1 percent of vertebrates, according to a report in the December 2006 issue of the journal Nature. Virgin births, by the process of parthenogenesis, happen when an unfertilized egg develops into an embryo using its two sets of maternal chromosomes. Scientists are more familiar with parthenogenesis in smaller invertebrates, such as aphids and zooplankton. In evolutionary terms, single-parent reproduction is not the best way to make babies. The gene pool of an isolated population dependent upon parthenogenesis becomes smaller, making it more vulnerable to disease and less adaptable to altered climate conditions or new predators. There is, however, a unique advantage to the female Komodo’s self-sufficiency. As a denizen of a chain of desert islands in Indonesia, a female dragon might very easily be swept away from her island to another island where no other dragons live. Yet she still can reproduce parthenogenetically and keep the species going. Gibson explained that because of the genetics involved in lizard self-fertilization, the offspring are always male. As soon as those baby boy lizards grow up, they can then reproduce with their mother. Eventually, a male dragon from another island might wash up on shore and diversify the gene pool. That’s not all that makes the Komodo remarkable. It also shares a mythical dragon’s predatory prowess. A member of the goanna family, with ancestors that date back more than 100 million years, the Komodo shares the feeding and dental characteristics of extinct dinosaurs, sharks, and sabre-toothed cats, according to a study released in the April 2008 issue of the Journal of Anatomy. Given their ability to attack and butcher very large animal prey, one might assume the Komodo dragon would possess a steely, snapping jaw like an alligator’s and a dense, sturdy skull. The opposite is true. The Komodo’s physiology is distinguished by what scientists call a “space-frame” skull, made of a light, rigid structure with interlocking struts that can handle big loads. What’s key is the shape of the bones and the way bones of different strengths are arranged. Instead of clamping down like an alligator, the dragon rapidly yanks off chunks of meat, and its powerful neck muscles and space-frame skull support the forces involved. Sixty razor-sharp, serrated teeth help, too. The Komodo was discovered by Western scientists in 1910, and its total population in the wild is estimated at 4,000 to 5,000 individuals. 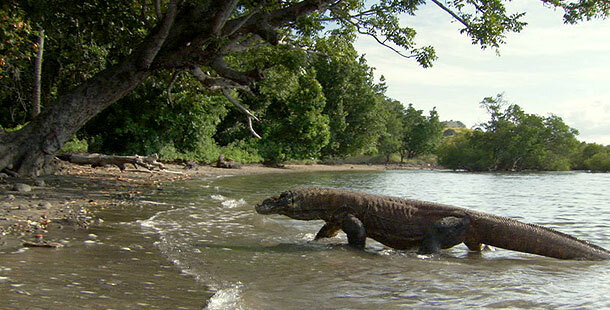 It can grow up to 10 feet long (3 meters) and weigh more than 300 pounds (136 kilograms). Its tremendous size is a result of island gigantism, as Komodos are the apex predators, dominating the ecosystems in which they live.